Keep in mind these wedding superstitions are just that, superstitions. Superstitions are defined as a belief or notion not based on reason or knowledge. Do what you will with these wedding superstitions, although they do make for some interesting reading. From the time the couple gets engaged and the ring is placed on her finger, the superstitions and traditions begin. The superstitions of the engagement ring start with the ring should never be fully removed from the bride’s hand. The ring should be moved from the left hand to the right hand by placing the two fingers end to end and sliding the ring to the other finger. With that the future bride should not allow anyone to try on her ring, especially a "female friend." Superstition has it that she will steal your fiancé if you allow her to try on your ring. During the Middle Ages, an exchange of rings and a promise constituted a legal marriage. This custom was manipulated by monarchs to their advantage to remove themselves of an unwanted spouse. This led to the custom of two rings - one for the engagement and one for the wedding. It is said that the engagement ring and the wedding ring is worn on the fourth finger from on the left hand because it was once believed that a vein in that finger lead directly to the heart. A diamond engagement ring was given by Medieval Italians in the belief that the diamond was created in the Flames of Love. The earliest evidence of wedding rings dates back to around 2800 B.C. in Egypt. In 860 the Roman Catholic pope (Nicholas I) declared that an engagement ring was required of all those who intended to marry. 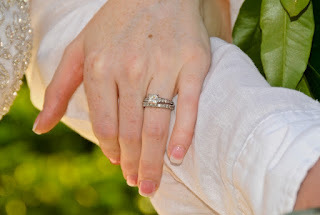 The never-ending circle of a wedding band symbolizes eternity because it has no beginning or end. This tradition grew out of an ancient tribal custom of using circlets of grass to decorate a bride's wrist and ankles. Early Celtic wedding rings were made of hair. The bride and groom would weave locks of their hair together into a braid and the bride would wear the ring as a token of their commitment. The Claddagh ring is considered the traditional Irish wedding band. It was originally a puzzle ring in three parts. The first part of the ring was given to the bride as her engagement ring. The second and third parts of the ring were kept by the groom-to-be and the witness of the engagement ceremony. At the marriage ceremony, all three parts would be reunited on the bride's finger. The Puritans renounced wedding bands because they considered jewelry frivolous. Colonial Americans often exchanged thimbles during the wedding ceremony because they were considered practical.. Later, the woman could slice off the bottom of the thimble to create a wedding band. Traditionally, the wedding dress has not always been white. Anne of Brittany made the white wedding dress a popular to the upper social classes in 1499. Before that, a woman just wore her best dress. 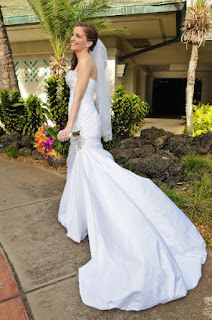 The modern wedding dress tradition says that the white dress symbolizes the purity of the bride. Queen Victoria started the modern tradition of wearing white in 1840 when she married her cousin, Albert of Saxe-Coburg. Today however, the color of the wedding dress is more dictated by what the bride will be happy with and the color scheme of the wedding. Though, wearing white is still a tradition that many brides choose to honor. It is considered bad luck if the wedding dress is torn on the day of or the day before the wedding. Any bride can understand why this is would be considered bad luck, it just adds to the stress of all that is going on and just not something that needs to happen right before the wedding. The superstition of the bride making or helps in making her wedding dress is considered bad luck by some and others say it is good luck. We guess this superstition depends on if the bride is good at sewing or not. Wearing a veil to cover the face is said to confuse any evil spirits that may be lurking around on this day. As with the bridesmaids, they are to surround the bride as to confuse the evil spirits as to who is the actual bride. Lifting the veil is symbolic of the bride leaving her father's household and officially joining her husband's home. something blue and a sixpence in your shoe. ... is a tradition that is commonly practiced today. 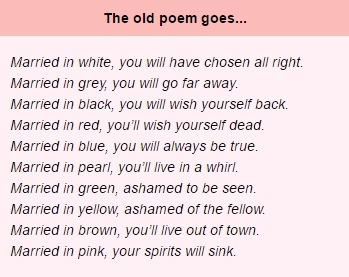 § "Something old" is traditionally given by a relative. This signifies the continuity from generation to generation. § "Something new" symbolizes home for the future. § "Something borrowed" is to make your marriage a happy one. Borrow an item from a happily married woman. § "Something blue" symbolizes fidelity, love and good fortune. Blue has been connected to weddings for centuries. In ancient Rome, brides wore blue. § "A sixpence in her shoe" to wish the bride wealth. The coin should be worn in the bride's left shoe. A sixpence is a coin that was minted in Britain. Another coin may be substituted. In a Swedish variation of this custom, the bride wears a silver coin from her father placed in her left shoe, while a gold coin from her mother is placed in the right shoe, ensuring she will never go without. The superstitions surrounding the date on which the wedding ceremony takes place is related to the full moon. It is said that a wedding should take place the day of a full moon. Many weddings take place in June. It is said that in June on the day of the full moon is most prosperous and long lasting union of all. What day of week should you be married? 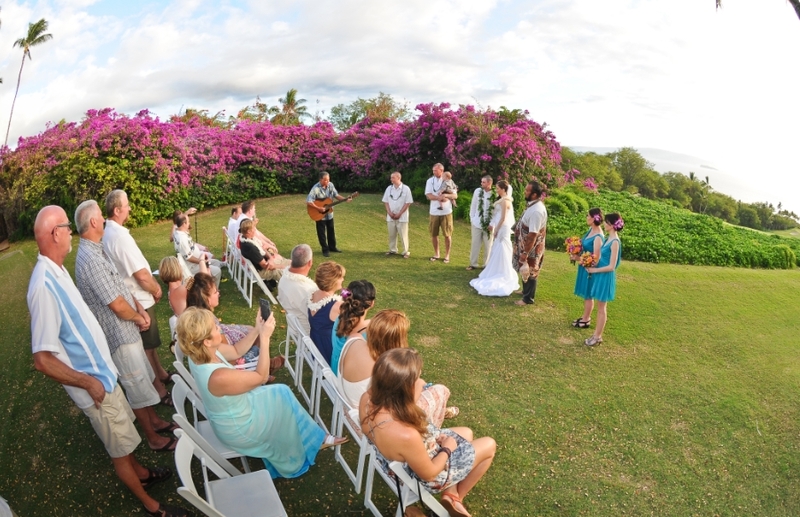 The most common day of the week for weddings is Saturday, as it's more convenient for guests, but there is a superstition that stems from English folklore about what day to get married. Monday brides will be healthy. Tuesday brides will be wealthy. Wednesday brides do best of all. Thursday brides will suffer losses. Friday brides will suffer crosses. Saturday brides will have no luck at all. There are also superstitions about the month you choose for a wedding, certain months were believed to be better than others. Should you marry on a sunny or rainy day? This superstition has several different interpretations. A sunny day wedding means good luck for the bride and groom. However, it is said that rain on your wedding day means that your marriage with be blessed with fertility and good fortune and it is said that rain on your wedding day means bad luck and a short marriage. This is a coin toss; Mother Nature ultimately has the upper hand on deciding what the weather is going to be. The bride is on the left and the groom on the right is from weddings of long ago. In the event the groom needed to protect his bride from intruders (today they are called wedding crashers) he needed his right side to be free so that he could grab his sword. The first kiss between the bride and groom at the end of the ceremony symbolizes the swapping of souls. The tradition of throwing rice at the couple as they leave the church is to bestow prosperity and fertility on the couple. It has recently been thought that the rice posed a danger to wildlife, so some couples replace the rice with bird seed or other types of eco-friendly substances like confetti. § It is commonly believed that the groom should not see the bride-to-be on the day of the wedding before she starts her walk down the aisle. § It is considered to be good luck for the bride to take once last look in the mirror before going to the ceremony. Though, many say that she should not be in her full wedding attire when doing so. Many recommend that she leaves off something minor, like a flower or a pin, while taking the one last look. Then, she can put that on on her way out. § Once she has taken the last look in the mirror, it is said to be very bad luck for her to come back and recheck herself. The wedding cake tradition is almost 2 thousand years old. The Romans baked a small loaf of bread. The groom would eat part of a loaf and break the rest over the bride's head. In Medieval England, guests would bring small loaves of bread that were piled in front of the couple, who then attempted to kiss each other over the pile. The tradition of the couple making the first cut into the wedding cake symbolizes their shared futures. A fairly recent tradition, dating back to the early 19th century, is to save the top tier of the wedding cake and eat it on the first wedding anniversary. 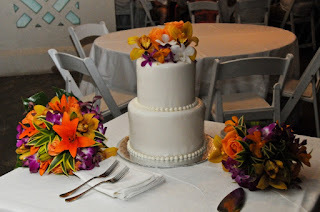 Originally the newlyweds ate the top tier to celebrate the christening of their first-born, not their first anniversary. The throwing of the garter comes from France where it is believed that pieces of the bridal attire were considered lucky. Today, the groom removes the garter from the bride’s leg and it is tossed to single men. The man who catches the garter is believed to be the next to marry. There is a similar superstition regarding the bridal bouquet toss. The woman who catches the bouquet is believed to be the next to marry. The giving of wedding gifts has been a long tradition in the history of marriage. Originally, couples were showered with symbols of fidelity, fertility, and prosperity. This superstition has evolved into today's commonplace practice of creating a bridal registry complete with a list of items wanted by the bride and groom. There are several superstitions that involve the custom of the bride being carried over the threshold by the groom. One of these superstitions was started by the Romans, the as they believed it was to make sure that the bride didn't stumble and bring the newlyweds bad luck. Another derives from an ancient belief that the newly married couple was very susceptible to evil spirits, and the groom carrying the bride over the threshold would protect her from evil spirits lurking below. Another variation is that in the past it was considered lady-like for the new bride to be resistant, or at least appear to be resistant to "give herself away" to her new husband. When the newly married couple would reach the threshold to their bridal chamber, the groom would carry the bride over the threshold to encourage her to go in.